By his words, President Emmerson Mnangagwa set the tone and precedence by adhering to the principle "African solutions to African problems" formulated by African themselves which Russia supports. Professor Vladimir Shubin, the Deputy Director of the Institute for African Studies, told me several years ago that "African leaders have to pay high attention to and take significant steps in promoting their achievements and highlighting their most development needs." Shubin, however, pointed to the truth that "Africans have to acknowledge the fact that the world has progressively changed and they must be seen changing with the similar positive pace. It’s about time Africans have to take development issues seriously and work progressively towards establishing good governance and drastically seek improvement in the welfare for its large impoverished population." 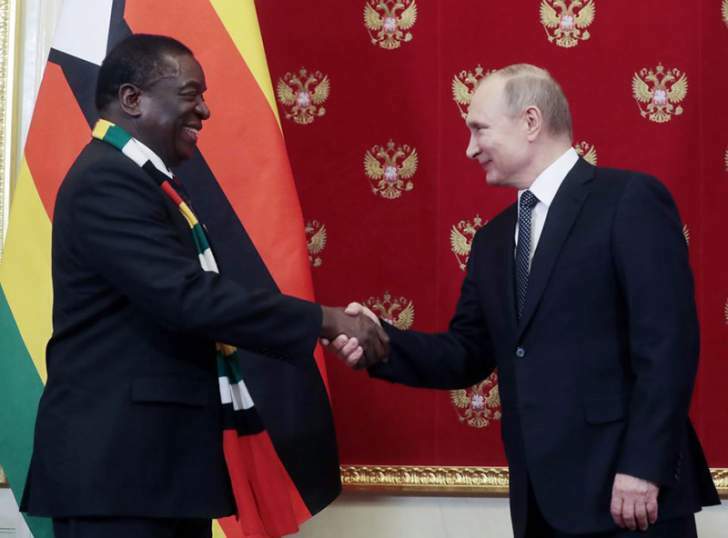 President Vladimir Putin pledges to help Zimbabwean counterpart President Emmerson Mnangagwa "to stabilize the political situation" by investing in the country. Zimbabwe has been looking for foreign investment in installing its energy, building infrastructure, modernizing agriculture and industry – foreign investors who could offer the necessary boost to employment creating sectors. Zimbabwe's Ambassador to Russia, Major General (rtd) Nicholas Mike Sango, told me in an interview discussion that, "For a long time, Russia's foreign policy on Africa has failed to pronounce itself in practical terms as evidenced by the countable forays into Africa by Russian officials. The Russian Federation has the capacity and ability to assist Africa overcome these challenges leveraging on Africa's vast resources." Zimbabwe, a landlocked country in southern Africa, shares a 200-kilometre border on the south with South Africa, bounded on the southwest and west by Botswana, on the north by Zambia and on the northeast and east by Mozambique. Zimbabwe is a member of Southern African Development Community (SADC). *Kester Kenn Klomegah frequently writes about Russia, Africa and BRICS.